Observation - Centaury? - UK and Ireland. 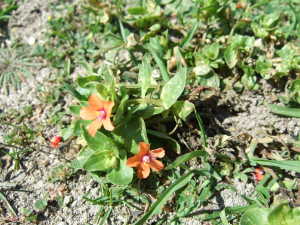 Description: Broad-leaved plant, less than 25mm high, orange/red flowers about 6mm across, paired opposite leaves almost meeting around stem, found growing on limestone in Tout Quarry, Portland, DT5 1BW. Broad-leaved plant, less than 25mm high, orange/red flowers about 6mm across, paired opposite leaves almost meeting around stem, found growing on limestone in Tout Quarry, Portland, DT5 1BW.